A garment perfectly tailored to meet your needs! XL Scrubs brings the chic and modern Junior Fit 34-inch Women's lab coat made up of poly/cotton peached twill fabric that ensures a comfortable feel and a professional look while you manage your workplace tasks. 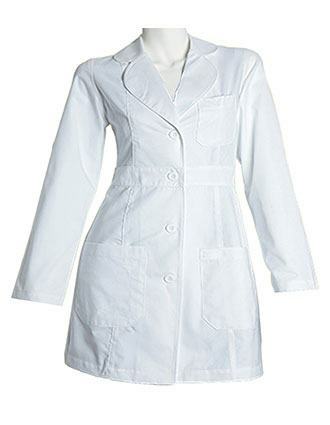 The solid belt on the back and the button closure on the front elevates the style quotient of this lab coat notch. To keep your tools and instruments handy, the coat renders two large front patch pockets and one chest pocket. The Tagless inside label and armhole gussets complete the look.